When my husband leaves me here in the madness and goes to that place called “work” I always speak of, he runs our families business. We own a home renovation and handyman service. Most of our clients are residential ones, but we do service a couple of large restaurants in our area. Last winter my husband brought me home some soup from one of those restaurants. 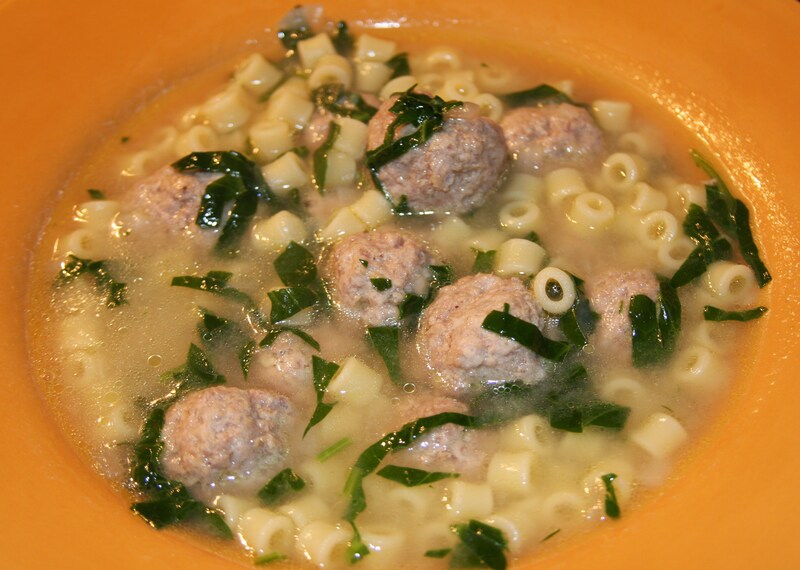 It was called, Italian Wedding Soup. I had never tried that kind before, but I really enjoyed the “marriage” of flavors with the meats, pasta and spinach. The only thing I didn’t like was that I thought their version of the soup was a little thin. I like my soup with a lot of “stuff” in it. If that makes sense. So, I set out on a quest to make my own version of this soup. I have made this one several times and it has become a family favorite. It is really easy to make, just takes a little time to mix up and roll out the meatballs. You just want to make sure that you do not make your meatballs too big. You will also want to serve this with a loaf of some type of crusty bread. One of my favorite parts of this soup is sopping up the broth with the bread. ** You can make this gluten free by using Better Than Bouillon for your broth (or another GF version) and GF bread crumbs in place of the Panko. 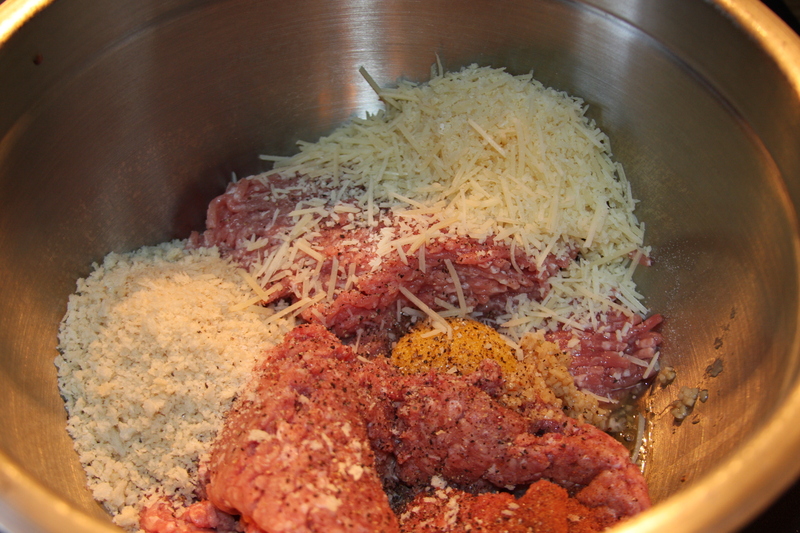 Combine the meat, egg, garlic, grated cheese, bread crumbs, salt, pepper, nutmeg in a medium size bowl. I use my hands for this so that I can make sure everything is very well combined. 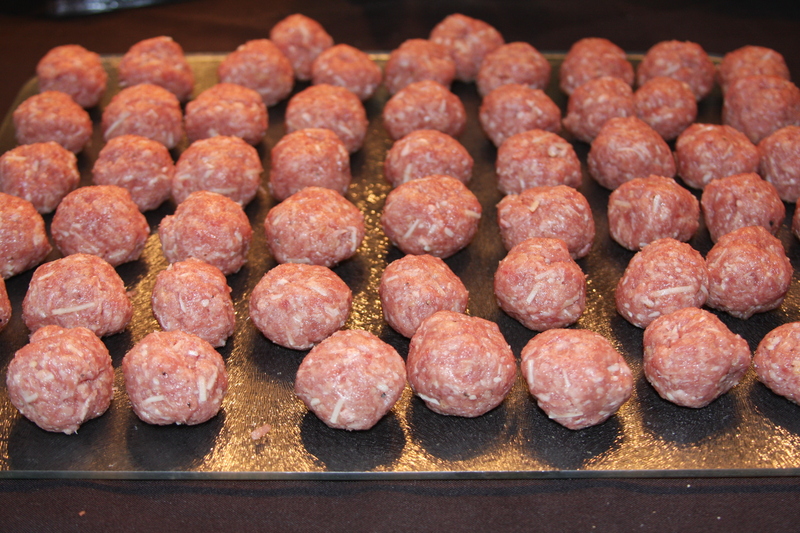 Take a small amount of the mixture and roll between your hands to make a meatball about 1 to 1 ½ inches across. You want them fairly small so they are bite size. Once you get them rolled out, set them aside. In a soup pot over medium heat add butter, onions and bay leaves. Season with salt and pepper. Cook for about 3-4 minutes, stirring occasionally. Add your broth to the pot, increase heat to high and bring the soup to a boil. When soup is at a full boil, drop in the meatballs. When they are in, give them a stir to make sure none of them have stuck to the bottom of the pot. I wait about 5 minutes to allow it to come back up to a boil, then add in the pasta. Be sure to give it another stir to make sure none of the pasta sticks on the bottom (you may need to do this a couple of times during cooking). Cover and simmer soup for about 10-12 minutes, or until pasta is cooked to your liking. 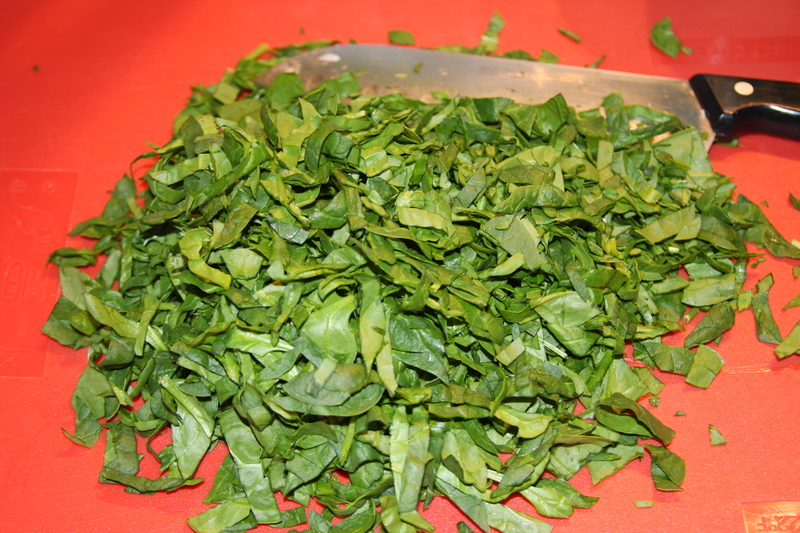 Uncover the pot and add in the chopped spinach and give it a good stir. I serve this with a loaf of Sesame Seed French Bread. Cut bread in slices, add some butter and toast for a couple of minutes, just until crispy. This entry was posted in Beef, Gluten-Free, Pasta Dishes, Pork, Recipes, Soup. Bookmark the permalink. The girls love the canned version, I can’t wait to make the real thing for them! Alexis will be home weekend after next. Thanks! They will definitely love this then, it is so good! Try it with the Better Than Bouillon, it makes a world of difference. I made it with that stuff for the first time and it was the only thing I did differently in the soup and it was the best pot I had ever made! I love the name for this soup 🙂 thanks for sharing!